It’s been quite a conference at Lake Tahoe. I’m here for the International Baccalaureate conference. I packed my watercolor supplies hoping to create some on-site, plein air sketches. An abundance of required classes, and several important planning meetings with my campus have all but squeezed out every opportunity. But . . . I did steal some time. 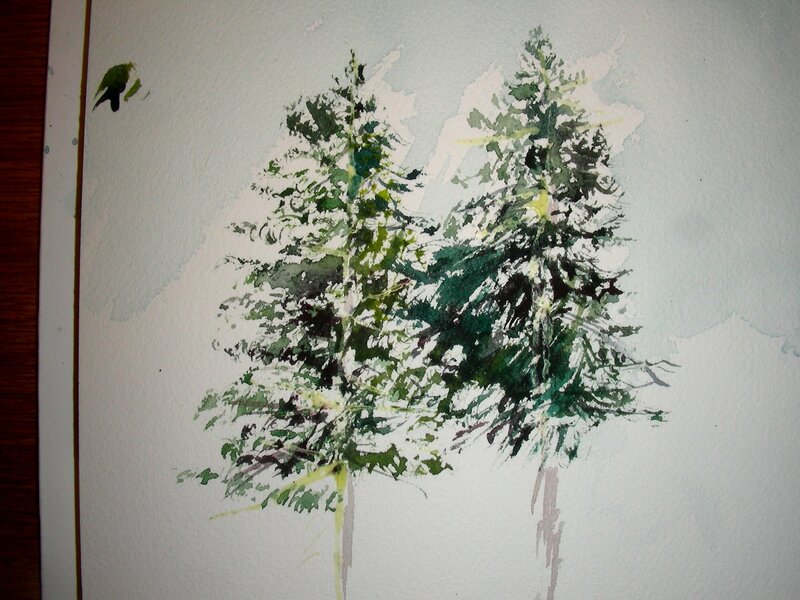 The one titled “Granlibakken Cedar” I did first, this morning, between breakfast and the first class. I only had 15 minutes, but there it is. I also must add that I don’t have Photoshop capability here on my laptop, so the editing of these photos, taken under incandescent lighting conditions, leaves much to be desired. There is indeed much more color on these pages than what appears on the blogsite. The three cruise titles I did this afternoon while on a 90-minute cruise around Lake Tahoe. 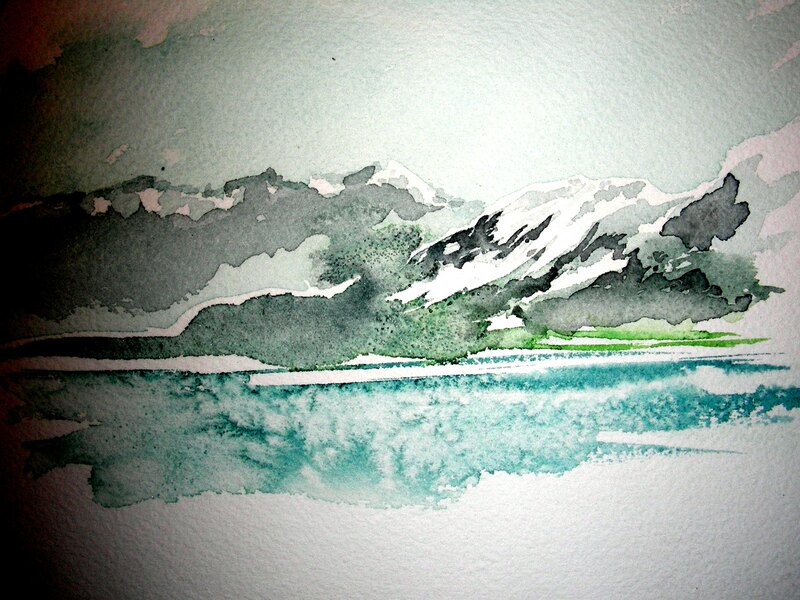 This is my first attempt to paint snow packs on mountain ranges from life. As you can see, #1 is very light and tentative, but by the time I got to #3 I was starting to get a little more bold in color in contrast. 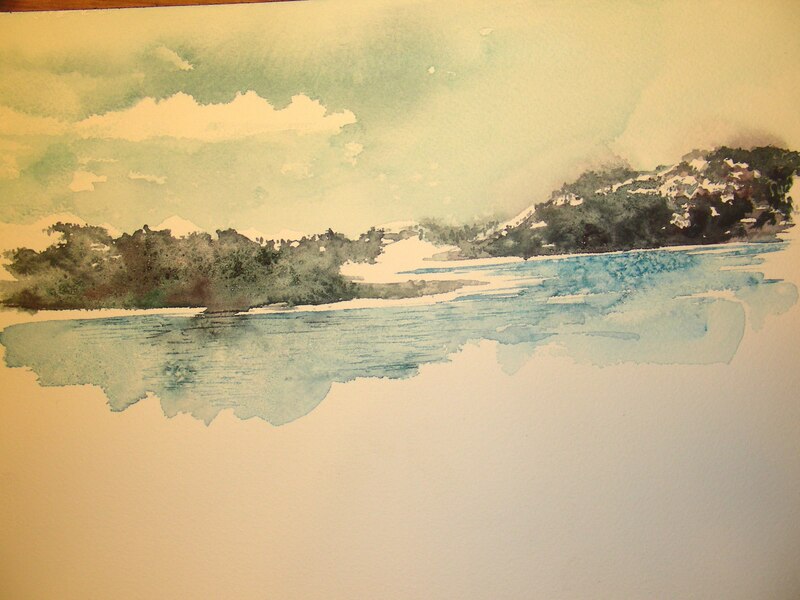 Incidentally, it’s also the first time I tried to paint a lake surface en plein air. The one titled “Granlibakken Evening” was one I tried after dinner. The light was fading, and again, I only had about 15 minutes to work on it before being called away to another campus planning meeting. Thanks for reading. I’m glad I got to do a little watercolor sketching while out in this beautiful location. I’m also delighted to be included in International Baccalaureate–it comes to our campus Fall 2011. I’m excited to take part. I’ll be teaching the course Theory of Knowledge. Tomorrow I fly back home and hopefully engage in some plein air work without distractions and interruptions. The morning rains brought the temperatures down to a cool 84 degrees this morning. I managed to find enough tree shade and use of my broad-brimmed hat to keep the light drizzle from interfering with this piece. I had a delightful hour-and-twenty-minute period of focusing on this subject, thinking of Andrew Wyeth, and trying really hard to concentrate on the details and drawing skills. 1. I’m delighted to return to some of the muted, earth tones that marked my signature style during my earlier body of work (2001-2009), but this time managed to get those colors on the page by using primary colors only (with the exception of one green). I have completely stopped using ivory black, burnt umber, sepia, yellow ochre, naples yellow, raw umber–pigments which were my staple during the last decade. Now I’m using only Winsor Green, Ultramarine Blue, Cobalt Blue, Cadmium Yellow Medium, Cadmium Red Medium and Alizarin Crimson. I’m delighted to get muted, natural earthy colors from these pigments. 2. I have gone “minimalist” on the supplies I haul with me in extreme situations. Tomorrow I fly out to Lake Tahoe for a four-day International Baccalaureate conference. I am scheduled to begin teaching the Theory of Knowledge course at Martin High School beginning fall 2011. Our afternoons will be free, so my intention is to get to Squaw Valley, then take a tram or nature trails up to where I can capture some mountain range vistas. For the trekking, I have managed now to get all my watercolor supplies (Winsor & Newton field box, Watercolor block, Brush tube, Water bottle) inside a small leather pack I purchased off a hot dusty street in the shadow of the Acropolis in Athens back in 2001. I’m very pleased now that I can complete a painting with just those essential elements in a light pack about 1/3 the size of a popular school backpack. 3. I’m happy to complete a plein air 9 x 12″ painting in under two hours now. I’m still working on speed, accuracy and painting more directly. 4. I enjoy the kinship and communion I feel with Andrew Wyeth, who left his home around 8:30 every morning, returned around 5:00 and laid out a body of work he had completed in the field. If I complete one painting in the field, then I’m very happy and satisfied. 5. Having worked exclusively in landscape settings over the years, I had grown fearful of close up still life studies and the discipline they seem to require. I’m happy now to have settled into that genre, outside my comfort zone. 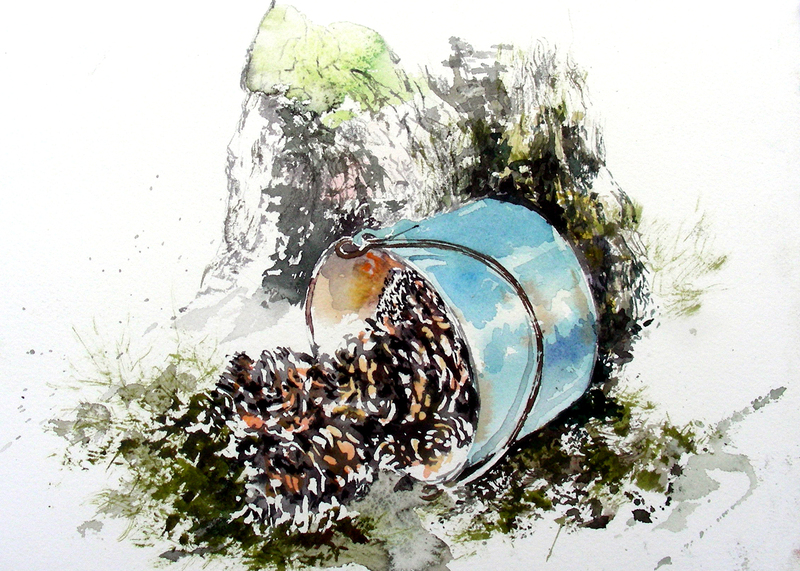 I have now done two watercolor drybrush studies and one pencil drawing of this pail and pine cones. 6. I save the best for last–at any point of my painting activity, all I had to do was look up to see my beautiful wife and soul mate, Sandi Jones, riding Andante and leading him over jumps out in the arena. I cannot explain the depth of satisfaction that I feel when working en plein air and having her nearby. Our journey to and from this location at Lyndon Acres is always satisfying, and the communion I feel with her as I paint goes too deep for words. I hope I will find the technology to blog from Lake Tahoe. Unfortunately, I still do not have a laptop with Internet access. And I’m not sure if I’ll have computer access in the lodgings where I’ll be staying the next several days. If I don’t blog from California, then I’ll certainly catch up the blog when I return home next week. I accompanied my wife Sandi to Lyndon Acres today where she was going to ride Andante. My plan was to get in a quick watercolor sketch, then head for the gym. Well . . . I failed to pack watercolor blocks or paper. I always carry spare watercolor blocks in my Jeep, but emptied all contents yesterday so I could have it washed and vacuumed inside and out yesterday at the Elite Car Wash. The watercolor blocks were still in my garage along with jumper cables! 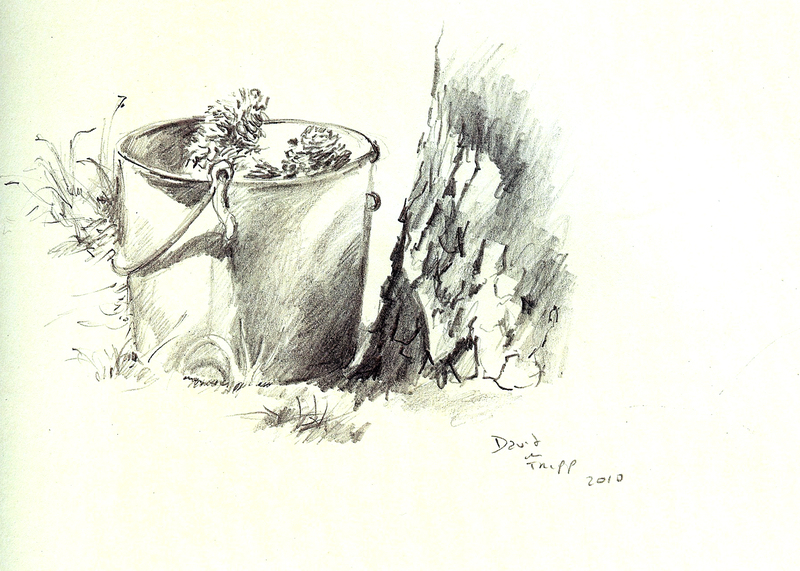 Oh well–instead I drew out an HB pencil and my journal, which contained good acid-free unlined paper, and I knocked out this quick sketch, thinking about how focused Andrew Wyeth always was with his pencil drawings. I need to work much more in this medium. Perhaps tomorrow. As Gaylord O’Con and I headed back toward Dallas, following a sweaty morning of painting in Grand Saline, we discovered this delightful Heritage Park in the small town of Edgewood. We found Mary Henson on the grounds, who welcomed us to explore the artifacts and make watercolor sketches of what interested us. She was filled with fabulous stories and facts, displaying her passion for research into the history of these small east Texas towns. I was fascinated with this beautiful preserved gas station complete with vintage pumps. The heat was oppressive, but the shade trees offered plenty of protection, and the occasional breeze kept us going. I’m glad we stopped here, and look forward to returning to this site. There is also a fabulous train station, reefer car and Union Pacific caboose nearby. 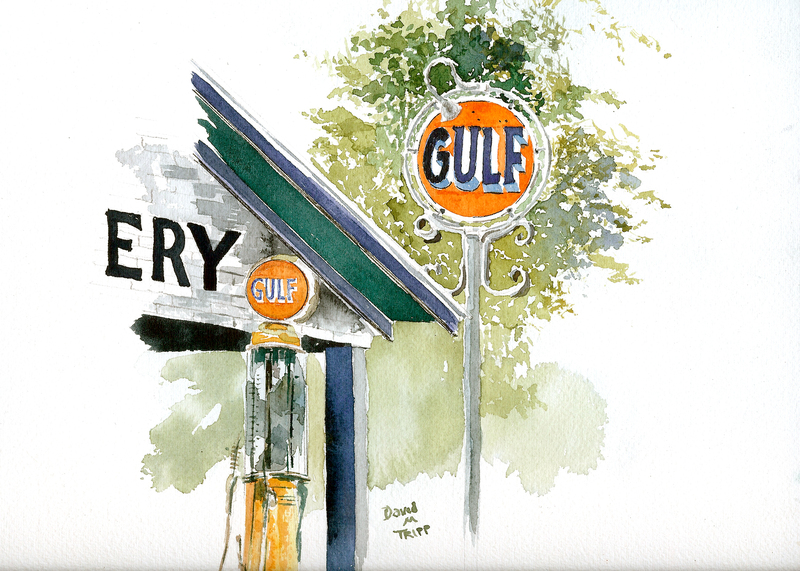 Friday morning, I headed to east Texas with Gaylord O’Con, a painting buddy I’ve recently met. The temperatures again soared to triple digits, but we got an early start on the morning, leaving Dallas around 6:00 a.m. We first settled beside this abandoned cotton gin. 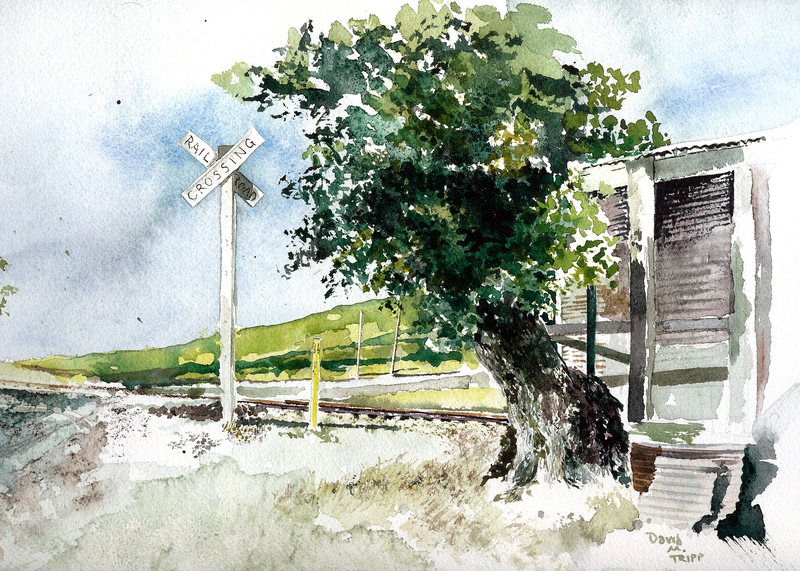 I wanted to capture some of the dynamics of the huge tree shrouded in shadow in front of the gin, along with the railroad crossing behind it. It isn’t an easy maneuver, trying to explain the depths of my feelings over this 5 x 7″ drybrush watercolor sketch. In one sense, it took 45 minutes to create; in another, it took 56 years to create. I still grieve over the passing of Andrew Wyeth. His drybrush studies captured the imagination of a bored ninth-grader in 1968. To this day, I can think of few significant Proustian moments from my own public schooling, but that day in 1968, when my Art I teacher Robie Scucchi placed his brand new coffee-table book of Andrew Wyeth on the table before me, and invited me to peruse its contents–I could never be the same since. Wyeth’s deep-seated fascination with Kuerner’s farm in Pennsylvania seemed a mirror reflection of my own obsession with my grandparents’ farm in Southeast Missouri. Every object strewn about the expansive property seemed to contain the “stuff” of revelation–that Proustian magic capable of transporting one back in time to early childhood memories filled with warmth and meaning. From 1968 until now, I have spent countless hours poring over my own collection of Wyeth books, catalogues, prints and magazine articles, soaking like a thirsty sponge the visual details of his sensitive drybrush renderings of everyday objects. Several years ago, in a Hillsboro antique shop connected to the gallery representing me, I purchased this blue pail with the white interior, and immediately filled it with pine cones. I was determined to create some Wyeth-style drybrush studies from it. Years passed, and the moment just did not present itself. I’m too busy, it seems–too distracted with daily details. But today marked the pleroma kairou–the fulness of time. I took my wife Sandi to Lyndon Acres to ride her horse. The temperature was nearing triple digits. I had only 45 minutes. So I set this pail of cones in the shade of a tree, and leaped right into the task, without taking time to think about it or change my mind. 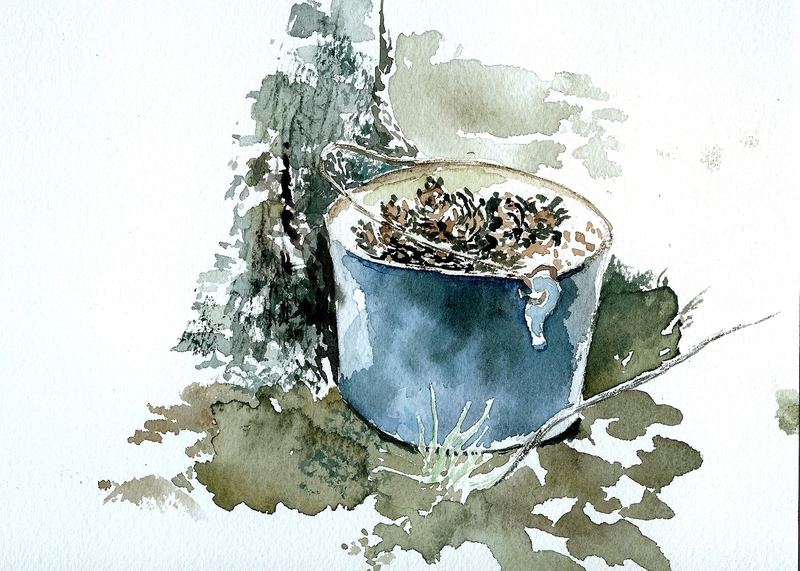 Before I knew it, the 45 minutes had expired, I had a watercolor sketch to serve as a record of the moment, and my communion with Andrew Wyeth was too profound for words or tears. This is the second watercolor still life I’ve attempted since 10th grade. The prior attempts are not worth recording. This one is. 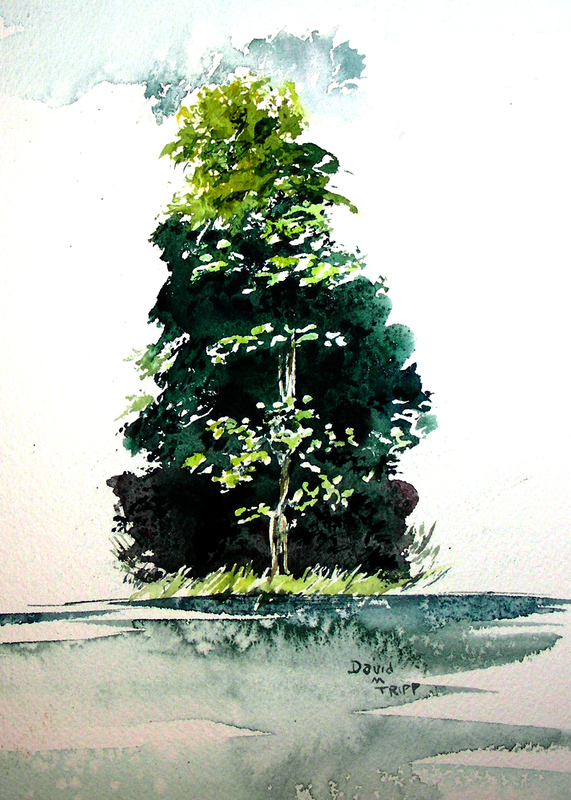 Tomorrow I’m going back out to do “something” en plein air. Maybe Wyeth will visit me again. But if not, today was enough for awhile. I’m still trembling. One evening after we finished class at the Eureka Springs School of the Arts, I travelled with Bill and Sandy Barksdale to the White River for some viewing. 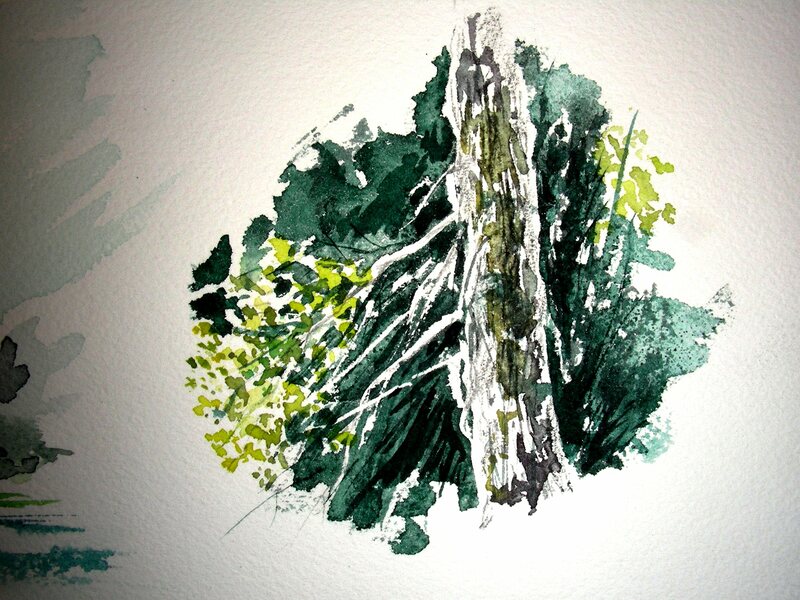 While Bill took photographs, Sandy and I attempted some quick watercolor sketches of the scene before us. The late afternoon sunlight was enchanting as it picked up the bright yellow-greens of some of the trees on the opposite shore. At the same time, fog was drifting over the water’s surface, and the colors of the river depths began to engage my imagination. This sketch only measures about 10 x 6″. I only had time to drybrush masking fluid for the highlighed leaves, then lay in the dark green shadows. 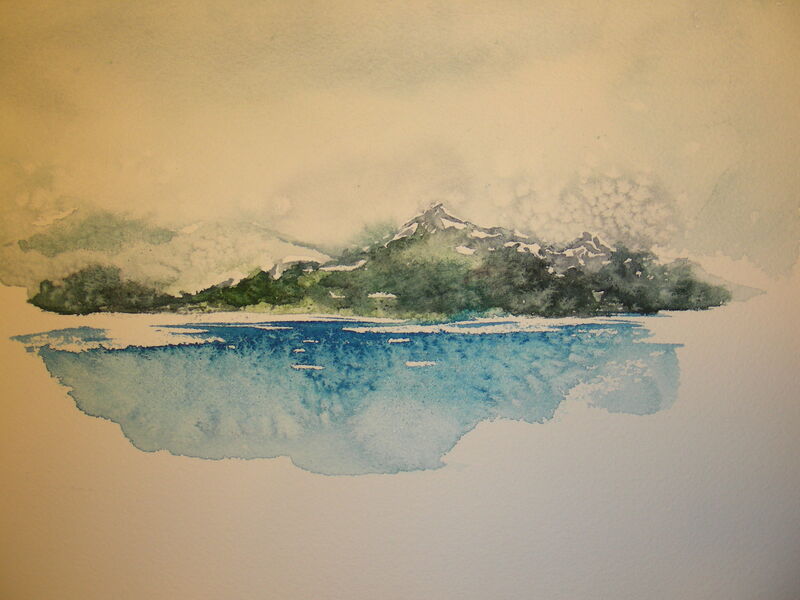 The water only took about 10 seconds to paint–about 4-5 horizontal strokes across the wet paper, and then plenty of salt sprinkled. Nature did the rest. Last of all, I blocked in a quick sky (probably 5-10 seconds, max). The following morning, I rose early and found a seat on a shaded bench on the beautiful grounds of the Crescent Hotel where the school lodged me for the week. As I entertained the hotel cat lounging at my feet, I scraped off the dried masking fluid and laid in a wet wash of light yellow-green to finish out the highlighed leaves. Though I put very little time into this sketch, I’ve really grown fond of it, maybe because of the memories it brings back of two special friends I met at Eureka Springs. I’ll always remember them taking me out to find places to paint, and especially Bill’s willingness to take me along as a fly-fishing buddy. We certainly found willing rainbow trout by week’s end! After a full day of painting, one of my Eureka Springs students, Sandy Barksdale, still had energy left for another plein air watercolor. We found this fascinating string of buildings near the old railroad depot below the historic Eureka Springs business district. The light was fading fast, and I had to work quickly. 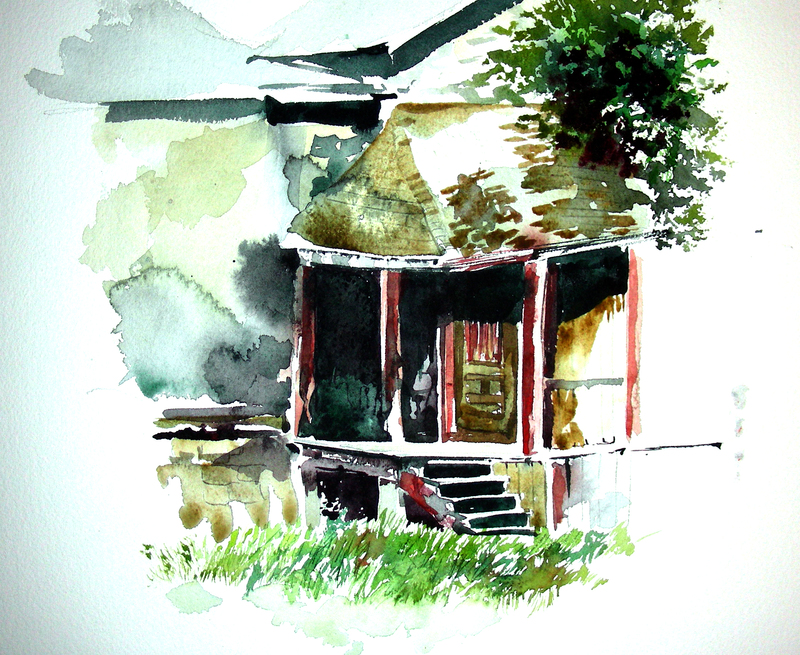 I was fascinated with the shadows playing about the sagging roof, porch, and steps attached to this derelict structure. This is a rough watercolor sketch en plein air that I created while the students at the Eureka Springs School of the Arts watched. The heart of it was done in 45 minutes. The embellishments were added as the day continued to unfold and the students busied themselves in their own paintings of the same subject. When I have more time, I will record the riches that I gleaned from working with these students–seven in all, and every last one of them focused and driven to study plein air techniques and explore new methods of watercoloring. I wish I could have spent a month with them, they were that stimulating. 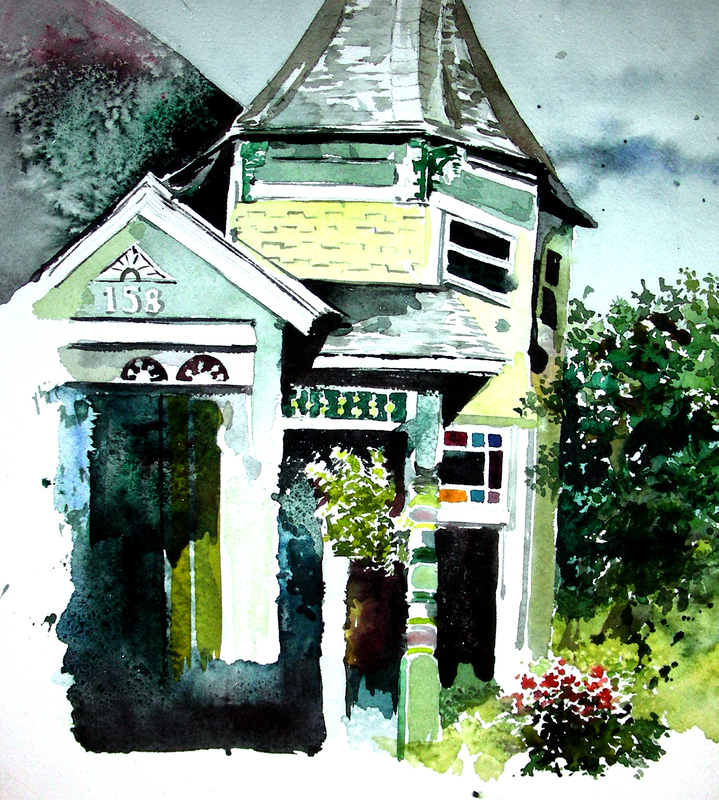 This particular structure is found on Spring Street in the historic section of Eureka Springs. The owner of the establishment was a real treasure, offering my class full use of her facilities (dining, air conditioning, restrooms, etc.). She made all the difference in the world, as we were working under an extreme humidity factor for two days at this location. I have finally returned from a one-week plein air watercolor class I taught at the Eureka Springs School of the Arts in Arkansas. The experience was fabulous for me–seven adult students very enthused about studying watercolor and applying techniques en plein air. I think that I actually learned from the experience more than they did–I honestly found them that inquisitive and stimulating. They have inspired me to work even harder in exploring this enterprise. What I have posted is an attempt at poured watercolor. Those of you who have followed my blog will recognize the subject matter–I painted this before, only smaller (this one measures 12 x 16″). I am the fly fisherman, and the setting is Beavers Bend, near Broken Bow, Oklahoma. I’m working from a photograph my wife took while we were there in summer 2009. On the first day of waterc0lor class in Eureka Springs, we were greeted with rain, so we chose to work inside the studio. During the afternoon hours I began pouring the upper half of this painting to demonstrate pouring techniques to the students. On Friday it rained again, so we stayed inside on that day as well. 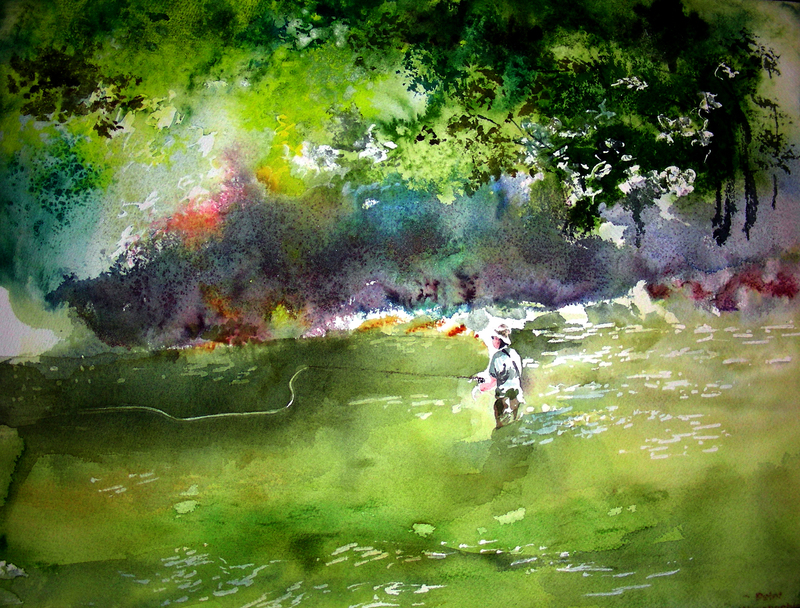 It was then that I decided to make the lower half a fly fishing composition. This painting is still in progress. There are plenty of rough edges to file away. Hopefully I’ll get back to it this week–I have plenty of other tasks that have managed to stack themselves around me and my studio. Tomorrow I hope to get back outside for some more plein air activity, although Texas is nearing triple digits daily and isn’t too pleasant for outside tasks.